V2 could stand for Version 2, since it is the new version of the original Molar Bean Bag™ we started making in 2004. We have sold thousands of the original Molar bag and have thousands of satisfied customers. V2 should probably better stand for Versatility and Value. This bag can be used in many ways with the addition of the new optional V2 Plate™. 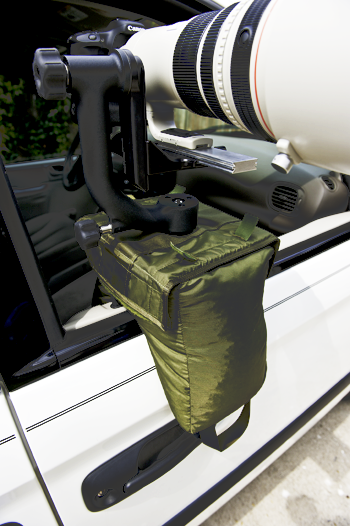 The V2 Molar Bean Bag™ is a fast and easy way to provide a window mount for a photographer's camera and lens. Designed to fit properly on a car door or window the V2 Molar Bean Bag™ provides superb camera support for any camera and lens combination. Its unique molar shape wraps around and hugs a car door or window. It provides a very solid platform for big lens (500mm, 600mm, 800mm) and also works well with any other lens/camera combinations. The V2 Molar Bean Bag™ is essentially identical to the original Molar Bag, but has two pieces of two inch wide Velcro sewn on the sides which allow the attachment of the V2 Plate™. The V2 Molar Bean Bag™ is made out of the same high quality nylon materials and same standards used in the parachute industry. My twenty years as a parachute manufacturer is the basis for the design and construction of my products. The nylon pack cloth has a water repellent finish to keep water out of the bag. The opening for the bag is closed with a top quality YKK zipper and every seam is double stitched and sewn with nylon thread. All our bean bags have been improved by being cut on a $50,000 computerized cutting table. All nylon parts are hot cut to sear the edges and prevent raveling. Not only does it excel on a vehicle door or window it can also be turned upside down and placed on a flat surface like a vehicle roof. In the upside down position the molar ears provide excellent support for large zoom lens and camera combinations. The V2 Molar Bean Bag™ can even be placed on its side and used to support a big lens combination. Every V2 Molar Bean Bag™ has two nylon straps for carrying handles. These handles can also be used as attachment straps to secure the bean bag in place. Bungee cords or any kind of cord can be used to secure the bag. The V2 Molar Bean Bag™ weighs 4oz empty and can weigh up to 16-17 pounds depending on the fill material selected and the desired volume. We ship them empty. Beans, bird seed, rice, shelled corn or a number of other materials can be used to fill the bag. When filled with beans, rice or bird seed the V2 Molar Bean Bag™ weigh 16-17 lbs. The bag weighs 12lbs when filled with black sunflower seeds and this is a good choice if the heavier fills are more than you want to handle. We stock Buckwheat hulls which will make the bag weigh 5-6 lbs. We sell the Buckwheat hulls for $16 plus $16 for shipping. We suggest you use the heaviest fill you are willing to handle. The heavier the bag the more stable it will be, especially if you are using a big lens like a 500mm, 600mm or 800mm. We make the V2 Molar Bean Bag™ in olive drab color, and usually have them in stock; however it is always best to check with us to make sure we are not out of stock. The cost is $49 each plus $7 for shipping.